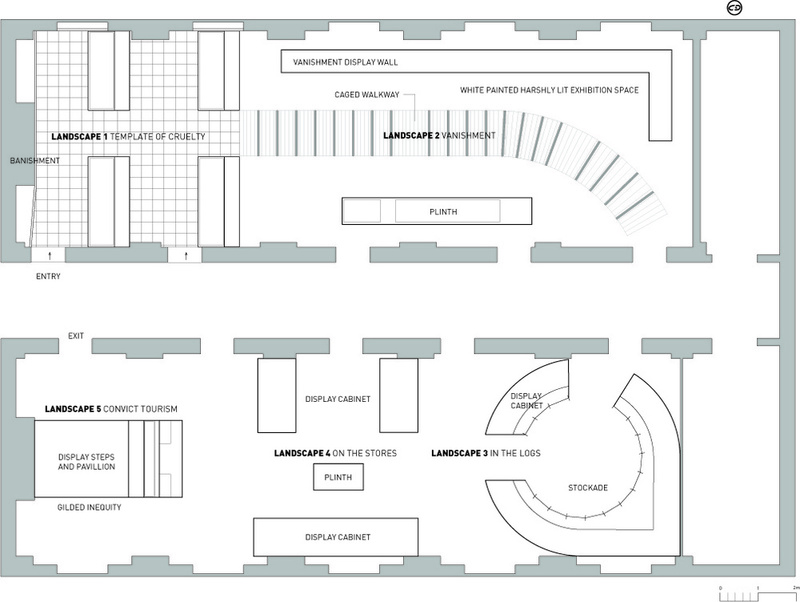 The central idea behind our design for the Convicts exhibition environment was to take the immersive strategies of comuter game designers and apply it to developing a space to view the exhibition content. We created a series of environments, each intended to abstractly, emotionally charge the experience and evoke the sensation of a violent, disorienting and disturbing journey. The exhibition was divided into 5 sections. Confinement and isolation or separation were key motifs for generating the 5 "landscapes". The space evoked is strange, alien and compressed. Towering canyon like steel wall compress the viewer. The walls are rusted metal, damp dripping with water. Sounds of dripping water can be heard in the background. The viewer enters the first space walking on a metal grate over a dank pool of infected water. This could be bilge or some effluent from an industrial or mechanical process. The space is intended to disorient the viewer with the distorted space. The interior might be a futuristic but oppressive transport ship or the interior might just be an abstraction of the transport ships from the first fleet. The space is dim with small lights above exhibited works. The space is designed to convey the distressing confinement of convict transport and the intended disorientation and isolation of this transport to another world far away from any familiarity and friends or family contact. The metal walls are punctured with TV monitors, maps and prints. The viewer enters this space inside a makeshift jail structure. Outside this rickety confinement is a harsh barren landscape, a bare over lit space. On each side of the prison runway is along monolithic sandstone plinth, on which objects, models, drawings and prints are arranged. At intervals it is possible to leave the prison runway and enter the surrounding landscape space. The sound of native birds can be heard softly in the background. In this space the relationship between confinement, isolation and disorientation has changed. The isolation has become more significant than the confinement. The disorientation is now due to the expanse of alien landscape rather than intercontinental travel. Some relationship with this landscape must be forged. The viewer enters a structure reminiscent of a stockade or rampart. From the outside, as a structure, it suggests some substantial, if paranoid building has been going on. A beach head has been established in the landscape. It is earth coloured like stone or mud brick. Inside the space is very different. The viewer is confronted with a mini agora-shaped opportunity shop. Prints, objects, models and clothing are stacked up behind glass panels, reminiscent of a shop front. One confronts the clutter of a more human existence for the first time. A move to a more normalized pattern of life has happened. The scale is more human and intimate without menace. There is still confinement, but it is ambiguous. It could be protection. 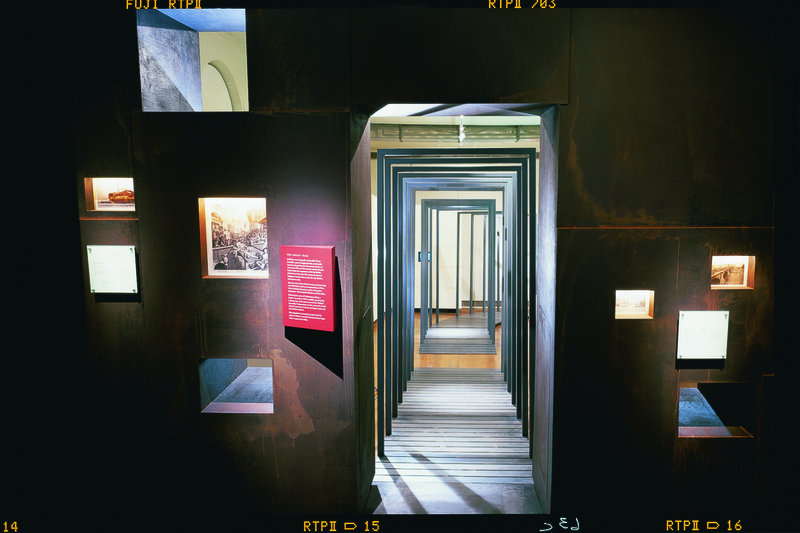 The viewer emerges from the stockade structure into a room of partially open closets, filing cabinets and lockers. Isolation has been normalised to the point of civility. It now falls within the trappings of the day to day existence. In order to view the exhibits the viewer must approach and further open the cabinets. They are all identical, reminiscent of prison cell doors or work lockers. This room also has the air of a very traditional museum, a respectable institution. To add to the atmosphere of the traditional museum a pig skeleton is mounted on a plinth in the middle of the room.